Version 1 Version 2 Version 3 Version 4 Version 4.2 AT-AT Reference F.A.Q. So. How tall is an AT-AT? As you might guess, I've done some checking on this matter. Turns out, there's a whole bunch of ways to determine how tall an AT-AT should be, depending on your sources, and how much you feel safe fudging. I've been able to get measurements as low as 49 feet and as much as 130. As you know if you're a big Star Wars fan, the movies are the real canon source as far as things go. Anything written in a book or even invented by licensed authors is "2nd rate" in comparison with something taken from the movies. I'll be looking at both. In this picture, we see Luke ascending up to the AT-AT's body. A great way to determine potential scale. However, what's not really clear is how Luke is positioned. Are his arms over his head? Is he holding something that makes him look taller? Are his feet dangling? Given that Mark Hammil is supposedly 5'9" (source: IMDB) I calculated the AT-AT's height between 73' and 113', depending on Luke's positioning. Another shot with Luke and the AT-AT, but this time, Luke's height is a lot easier to determine. What's not so easy to determine here is the AT-AT's full height in pixels, since it's obviously not shown. 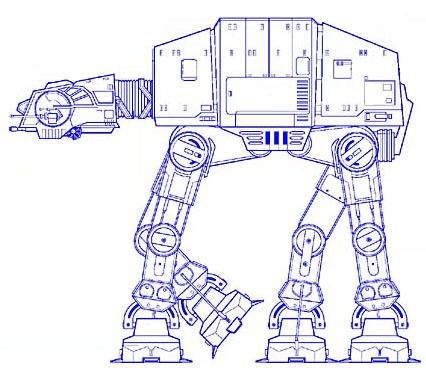 However, using a NON-CANON source (the AT-AT blueprint shown below from The Essential Guide to Vehicles and Vessels) I calculated the AT-AT's height between 62' and 75', depending on how far forward Luke is in this shot relative to the planted AT-AT foot. Here's a tricky one. 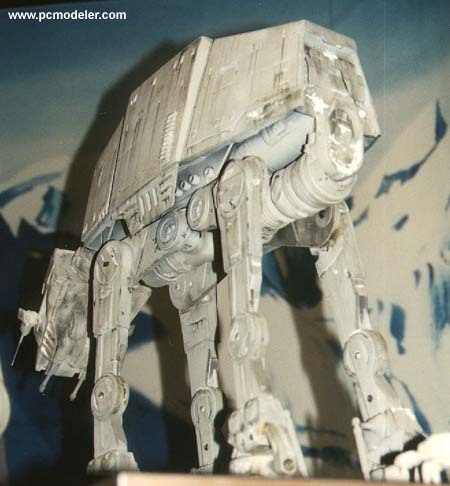 The AT-AT foot appears to cover between (about) 87% and 92% of the Snowspeeder's length. But how long is a Snowspeeder? And how tall is the rest of the AT-AT? Using some canon and some non-canon sources, I made high and low estimates for the Snowspeeder's length, and again used the Essential Guide's blueprint. (I use that blueprint a lot!) From these, I estimated the AT-AT height between 54' and 67'. Similar to the previous image, this calculation is again based on the relative size of the Snowspeeder. Using dimentions again calculated from non-canon sources, I found the AT-AT height for this snapshot to be between 85' and 130'. Notice the somewhat large discrepancy again, due to the motion blur on the Snowspeeder, its odd angle, and its relative position to the AT-AT body (IE how far under the AT-AT is it?). Guide to the Star Wars Universe: "over fifteen meters"
Art of Empire Strikes Back: "fifty feet high"
But those numbers really don't seem to be based on anything, especially considering that the smallest possible measurement that I was able to get from the 4 above references was 54 feet. Hence, I typically treat this figure as kind of silly. 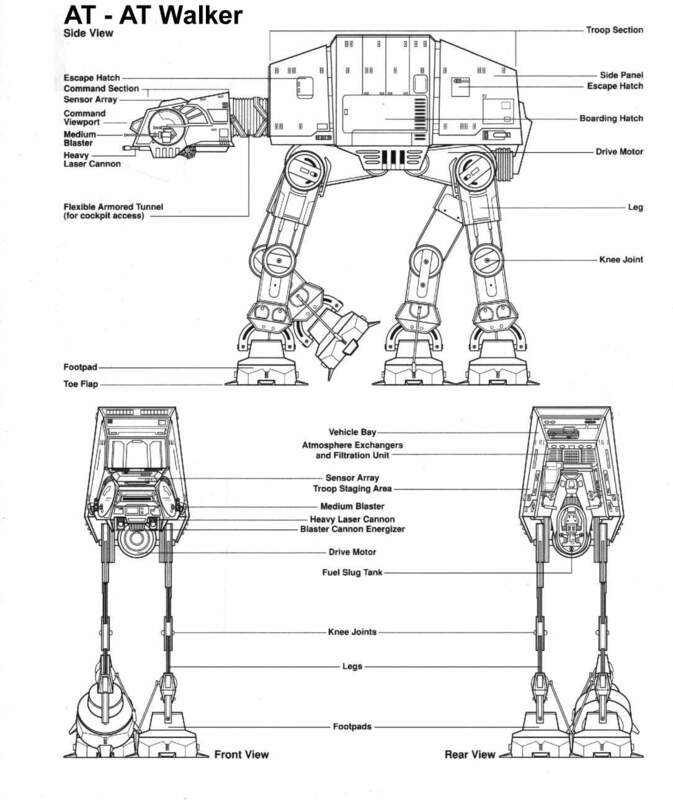 Using this blueprint found in The Essential Guide to Vehicles and Vessels, we can take a good guess at AT-AT height, based on the fact that somehow, General Veers apparently stands within the head of the AT-AT. Knowing that Julian Glover (the actor portraying Veers) is 6'3" (Source IMDB), I found that in order to squeeze Veers in, the AT-AT's height is at a minimum 49'. And, at a "best guess", a maximum of 85'. Other non-canon sources (I haven't scanned the images) for AT-AT height can be found in the Star Wars Incredible Cross Sections and Star Wars Technical Journal books. 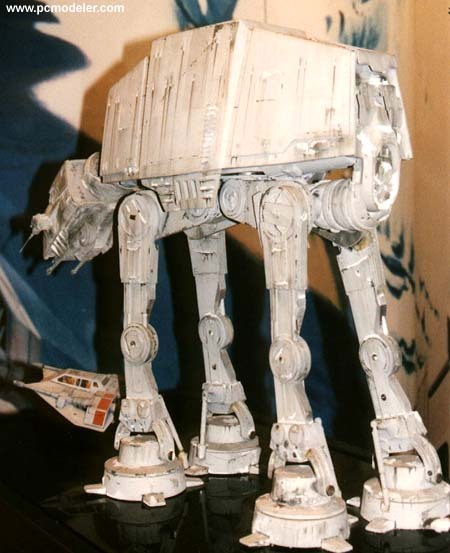 Both books feature views of the AT-AT with figures for scale. Using the Incredible Cross Sections picture, I calculated an estimated height of 63' to 72'. 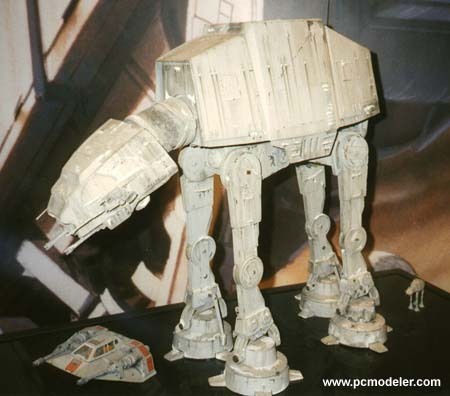 The Technical Journal's image is a little harder to use, given that they only show a cutaway for the AT-AT's body with figures for scale. Using other images for a relative scale for the body in proportion to the legs, I came up with a resulting height of 57' to 65'. Now, the average based on all the above estimates is about 72 feet. For the Lego AT-AT, I used an estimated height of 75', based on a minifig being about 6 feet tall. (Note that average human height is closer to 5.5 feet). So what's inside an AT-AT? Troop Seating - Most (if not all) sources quote capacity for 40 troops inside the AT-AT. Standing or sitting? Seats or benches? Not really clear. The Incredible Cross Sections diagram shows troops seated (13 shown, 26 implied with remaining seating not visible) mostly on the top 'deck' of the AT-AT, with a cleared staging area by the large doors in the lower middle section. Of interesting note is the fact that the Incredible Cross Sections seat placement would seemingly block the forward, upper-level escape hatches. The Technical Journal shows troop benches instead of seats, placed again on both decks, but with a longer bench on the lower level rather than the upper level. 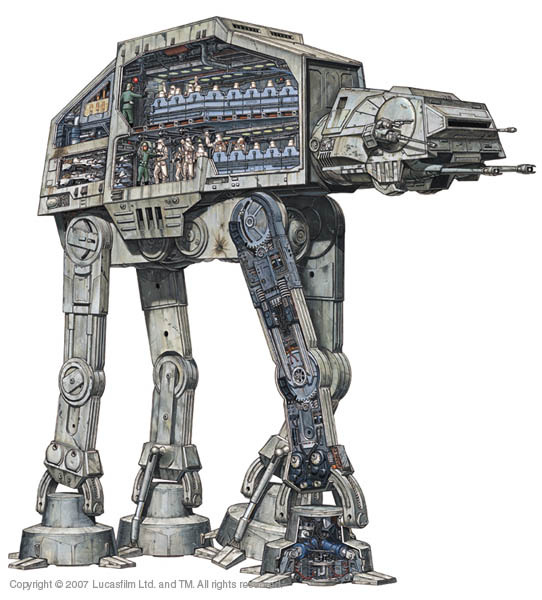 The cutaway view, however, neglects to show the large lower side boarding hatches, showing instead a large wall of "piping and conduits", which leaves one to assume that there is only a boarding hatch on one side of the AT-AT instead of on both sides. Vehicle Bay - Lots of sources also quote the AT-AT as having a vehicle bay, carrying 5 speeder bikes. Where it's located and how they get out is another question. 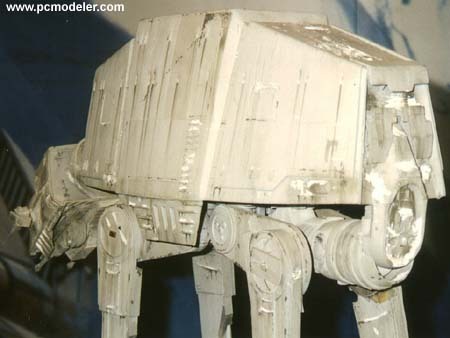 The Essential Guide and Technical Journal show the vehicle bay as being in the top-rear section of the AT-AT body. 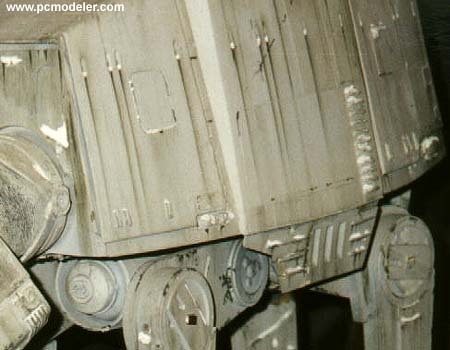 The Technical Journal also shows a vehicle access hatch in the top rear panel for exiting the AT-AT. The Incredible Cross Sections diagram shows the speeder bike garage on the lower rear level, though doesn't show how the bikes exit. Assumedly the bikes are pulled into the central lower level staging area and exit through the large bay doors along with troops. Also of quasi-interesting note, the Cross Sections book shows a white/grey version of the Speeder Bike stored in the AT-AT, unlike the browner/dark-grey version shown in the films. 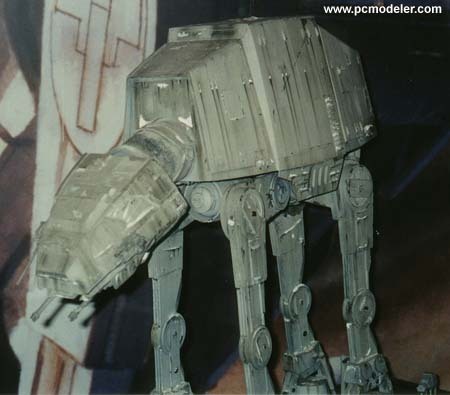 And in case that wasn't enough, the Star Wars Source Book reports that some variations of AT-AT walkers are modified to fit two scout walkers inside them. 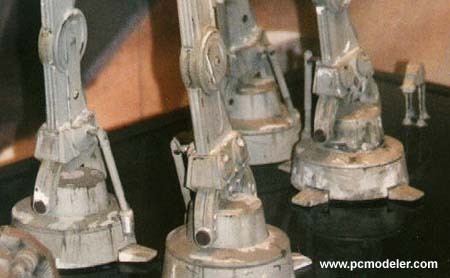 How that's possible, assuming they mean AT-ST's on the scale of the ones shown in Return of the Jedi, is beyond me-- but I'd love to see a version done that way! Engine Room - While most of the engine is apparetnly positioned in two large cylinders underneath the body of the AT-AT, an engine room is shown inside the body in both the Cross Sections and Technical Journal cutaways. The Cross Sections diagram's placement of the engine room (top rear area) seems to (again) conflict with the top-level rear escape hatches. 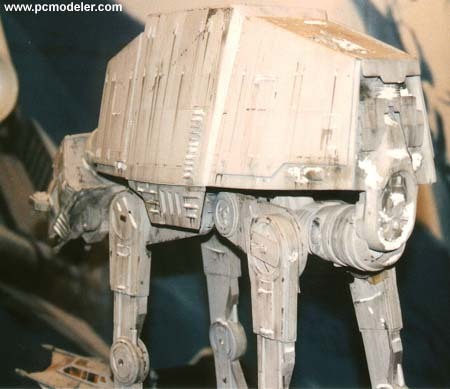 The Technical Journal's diagram shows the engine room in the lower rear section of the AT-AT, which seems more likely, given its proximity to the drive cylinders underneath the AT-AT body. So, how fast do those walkers really go? Most sources will tell you that they can go up to 60kph (a little over 37mph). Did they go that fast in the movie? Nope. In the movie, the walker moves each foot individually, so it's always got at least 3 feet on the ground. 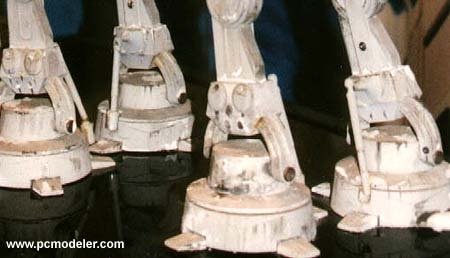 Each step takes about 1 second (a little over 1 second by repeated stopwatch estimates), and is slightly over 1 "AT-AT foot" long. 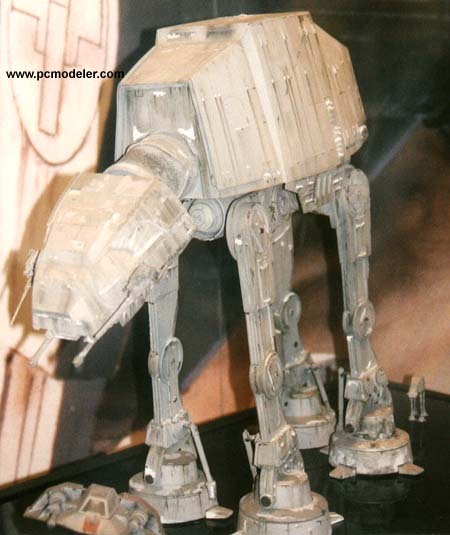 So that means the AT-AT's in the movie are moving a little more than 1 foot-length per 4 seconds. And how long is an AT-AT foot? Using the 49' - 130' estimates, an AT-AT foot is about 11.5' - 31', most likely a bit under 18'. How fast is that? Between 3kph (2mph) and 9kph (5.6mph), most likely around 5.4kph (3.4mph). Pretty depressingly slow, huh? (That's about regular human walking speed). What's that extra leg segment (A) do? 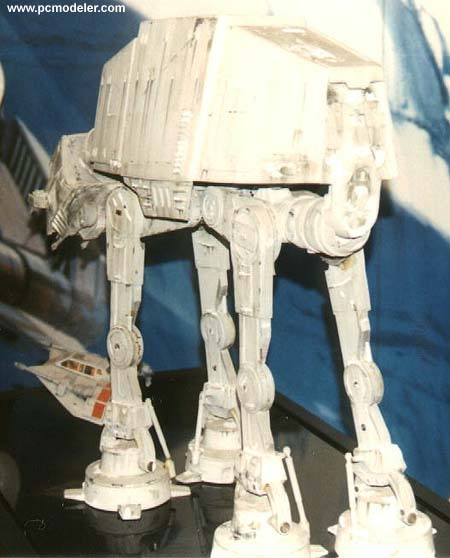 It keeps the body of the AT-AT more or less level when walking, allowing the regular hip joint (angle beta) to sag a little during a step. 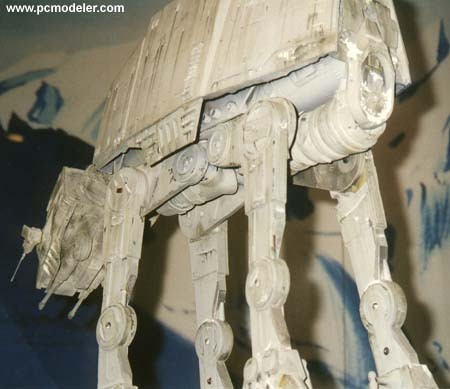 Now, this means an AT-AT can take a stride up to about 51 feet without any up-and-down or side-to-side motion in the AT-AT body. Any larger than that, and the body starts jerking up and down. So what happens with the 82 foot stride necessary to get the AT-AT up to 60kph? 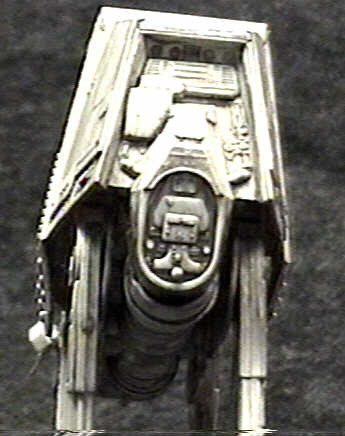 You get an AT-AT that bounces along merrily, looking like something from out of a Pepe Le Pew cartoon. A very amusing thought, especially considering the toll it would take on any passengers. But that's assuming that 3/4 second foot stride. What if it's more? How about less? In order to pull off 60kph with a 51 stride, the stride time has to be about 0.47 seconds. Pretty darn fast. Plausible? I suppose being science fiction anyway, sure! And what if it were a 1-second leg stride like in the movie? It would require a stride length of 109 feet! And that's actually not possible for the AT-AT to do (unless it is indeed bounding through the air). 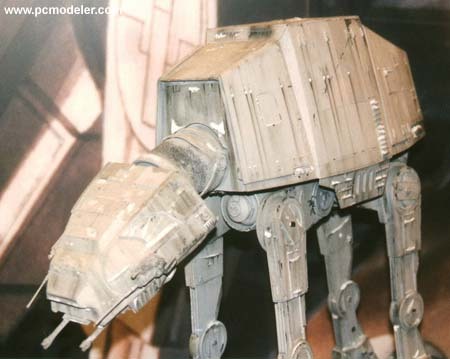 The AT-AT's motion was based on the movements of elephants-- so if we assume an elephant as a model, we could also arrive at top speeds of 60+ kph. Elephants are typically between 3-4 meters tall, and can reach speeds of up to 25kph. 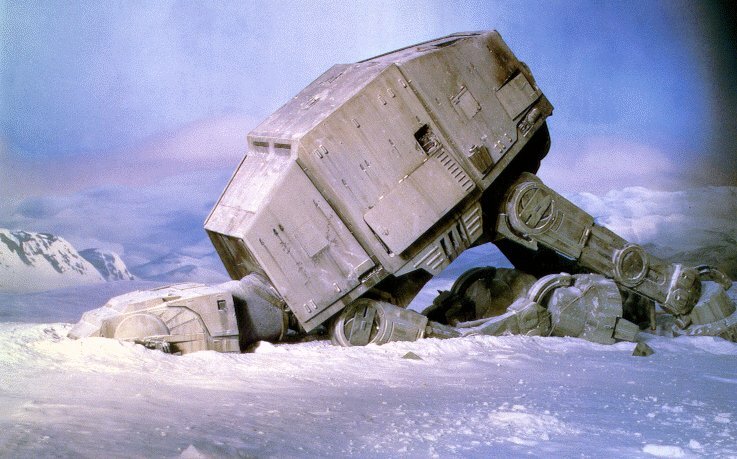 An AT-AT is at least 3.5 times as tall, and reportedly only 2.4 times as fast. 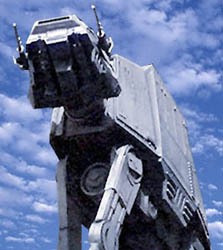 Hence, by sheer ratio, an AT-AT would easily be capable of 60kph speeds. However, that does imply elephant-like motion, which at 25kph, requires elephants to run with sometimes only a single foot touching the ground. 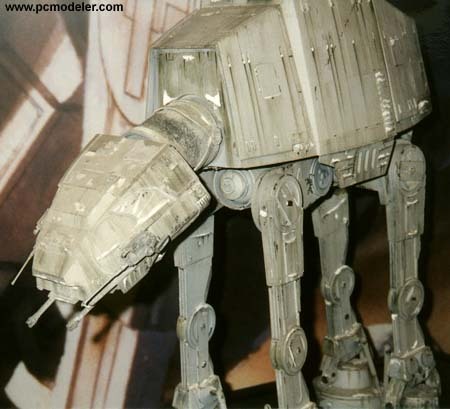 When designing the Star Wars toys, Kenner quickly realized they had no idea how troops were intended to leave the AT-AT. And after asking Lucas, they were no better off. So the question became answered by various "non-canon" sources. Up until the release of the Incredible Cross Sections, it seems most sources held that AT-AT's "kneeled" to release their troops, lowering ramps for troops to run out on. However, it seems a little impractical to stop the vehicle to release troops, not to mention rather tricky from a design standpoint. The Cross Sections book offered a more plausible solution, wherein troops descended from the sides of the walker via zip lines extended on booms from the main body and reaching down to the ground. Star Wars Technical Commentaries - Lots of detail on the walkers (dunno where he pulls that "10 meter stride" from, but otherwise, pretty accurate info. Blueprints - Great collection of blueprints, appears to be retraced from The Essential Guide. Official Stuff - Not overly useful for model building, but some interesting tidbits. The below images are non-canon (I've collected them from the internet, and are used below without express permission), but they're pretty helpful for reference.